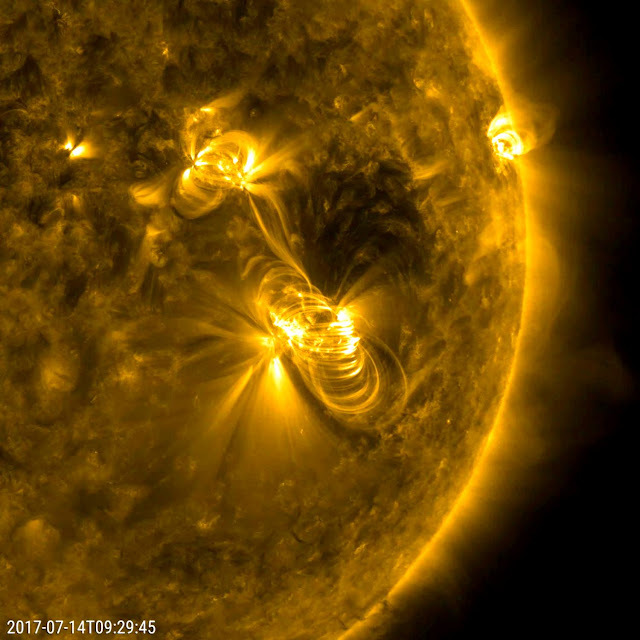 A flare medium-sized (M2) flare and a coronal mass ejection erupted from the same, large active region (July 14, 2017). The flare lasted almost two hours, quite a long duration. Coronagraphs on the SOHO spacecraft show a substantial cloud of charged particles blasting into space just after the blast. The coils arcing over this active region are particles spiraling along magnetic field lines, which were reorganizing themselves after the magnetic field was disrupted by the blast. Images were taken in a wavelength of extreme ultraviolet light.